Users of Cytoscape can now natively retrieve interaction networks from STRING ! During a recent workshop at the EBI, a common web service API to query interaction databases (called PSICQUIC) was finalized. Once all interaction databases have implemented this interface, it will be possible to use a single client (a Cytoscape plugin for example) to interact with all of them. We are committed to this initiative, and look forward to the implementations. In the interim, we have decided to also release a small, custom-made plugin for Cytoscape called StringWSClient, which interacts only with the STRING database. This allows us to offer users the full range of features that the STRING API allows (e.g. to show all available species, or to resolve ambiguous inputs). Version 1.0 (1.1) supports only the import of interaction networks; upcoming versions will be able to extend existing networks, filter them using STRING specific criteria, etc. The 1.0 version works only with Cytoscape 2.6.1, and 1.1 was released to support the whole 2.6.x branch. To install it, fire up Cytoscape, open Plugins/Manage Plugins dialog and pick StringWSClient v1.0 from "Network and Attribute I/O" section. You may have to restart Cytoscape to load the plugin. See Cytoscape documentation for details. The plugin resembles STRING's web user interface: a field to type queries and the organisms selector. 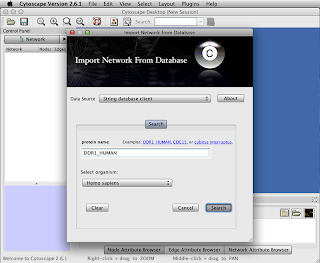 In the background, the query is sent to the STRING database and the resulting interaction network is fetched and displayed. We're looking forward to your feedback ! Milan Simonovic and the STRING team. I am trying to install the String plugin for Cytoscape. I tried to launch different versions of Cytoscape with different versions of String plugins but the String "button" never appear in the plugin list of Cytoscape whan it is launched. I tried with storing the String '.jar' in the Cytoscape plugins folder. Is there a bug or a versions compatibility issue ? The version issue is solved ! @MNikolov: no, its not possible, will be in the next version. Is it still not available? why? Sorry, could you please be more specific: what is "it" that is not available?